A: The fact that adrenal fatigue doesn’t really exist. B: The fact that the most common recommendations for treating adrenal fatigue actually put more stress on your adrenal glands while ruining your thyroid in the process. There’s really no such thing as adrenal fatigue. Because it’s impossible for your adrenal glands to actually fatigue. In fact, Dr. Hans Selye, the forefather of modern endocrine research, showed that you could remove the entire contents within the adrenal capsule and the adrenal tissue will regenerate rather quickly. Your adrenal glands are rather miraculous if you think about it. But I also know this because long ago when I studied Functional Medicine, we used to run adrenal labs on all of our clients. And way back then we used adrenal support supplements and the same illogical and ineffective diets that are being recommended today for adrenal fatigue. After retesting adrenal labs every 3 months we rarely ever saw improvement. And in many cases adrenal function became even worse. Every wonder why so many people with adrenal issues never get better? When I figured out what I’m going to show you today, everything changed. Now, how we fix adrenal function actually works. And it work extremely well. It has everything to do with your thyroid and your diet, which I’ll show you in a second. 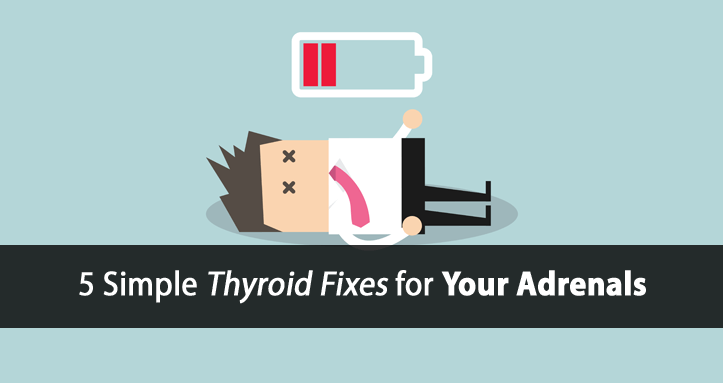 And I’ll also be giving you five simple fixes for your adrenals that will actually help your thyroid rather than ruining it. But, before we do that, you have to first understand why adrenal fatigue is really a hoax. If you aren’t using this protocol then get started now. You can download it for free right here. As I mentioned previously, adrenal fatigue doesn’t exist because your adrenal glands don’t actually fatigue. However, you can easily develop “adrenal insufficiency” (lack of cortisol) with hypothyroidism. But while many people will tell you that you have to treat your adrenals in order to improve your thyroid health… it’s actually quite the opposite. 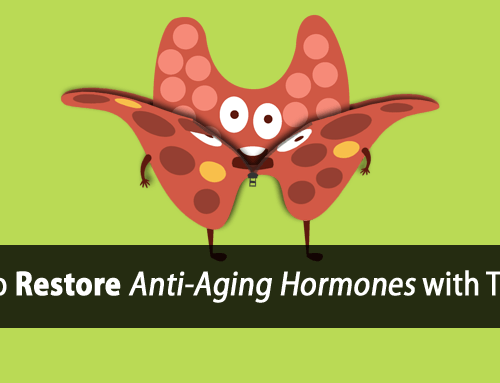 Your body requires thyroid hormone (T3) to produce your adrenal stress hormones. Can you make a cake without all the necessary ingredients? And this is why your cortisol levels begin to drop, the more hypothyroid you become. Not because your adrenal glands become “fatigued”. It’s because you lack the thyroid hormone (T3) you need to produce that cortisol. So, if you’ve developed adrenal insufficiency, it’s because you’re hypothyroid in the first place. We just established that your body requires thyroid hormone in order to produce cortisol. And when you become hypothyroid, your body is forced to compensate by over-activating your adrenal glands… forcing your body to over-produce cortisol. 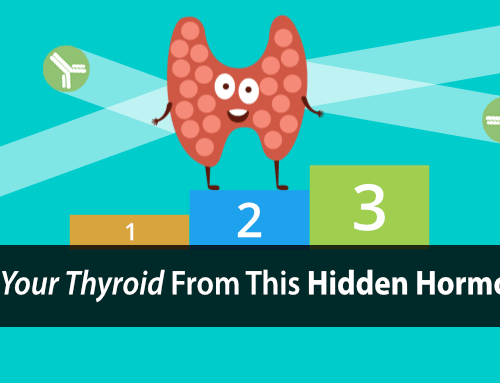 … which further decreases your thyroid hormone (T3) levels. Glucocorticoids decrease in conversion of thyroxine into 3, 5, 3′-tri-iodothyronine by isolated rat renal tubules. It all boils down to supply and demand. The less thyroid hormone (T3) you have available, the more your adrenal glands are stimulated. And the more your adrenal glands are stimulated, the less thyroid hormone (T3) you have available. 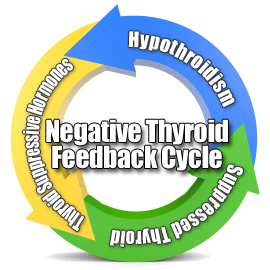 This creates a viscous Thyroid-Adrenal Stress Cycle. 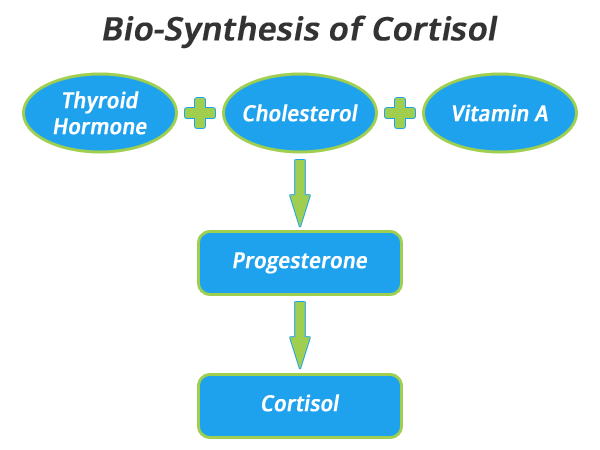 As this thyroid suppressive cycle continues, you eventually reach a point where the demand for cortisol exceeds your ability to produce it because you don’t have enough thyroid hormone (T3) to do so. This is how you progress through what are commonly referred to as the 3 stages of adrenal fatigue. Initially with hypothyroidism we see a rise in cortisol levels as demand increases (oftentimes referred to as stage 1 of adrenal fatigue). Then, as your thyroid hormone (T3) levels continue to drop, you begin to lack the thyroid hormone needed to continue producing this larger demand of cortisol, and cortisol levels begin to fall (oftentimes referred to as stage 2 of adrenal fatigue). Then, as this viscous cycle continues further, you become more and more deficient in thyroid hormone and your cortisol begins to plummet (oftentimes referred to as stage 3 of adrenal fatigue). Oftentimes you will hear that if you experience any of the above symptoms when taking thyroid hormone that it’s a sign of adrenal fatigue. In reality, thyroid hormone (T3) makes you more sensitive to the effects of adrenaline, thus intensifying these symptoms. And this is where adrenal fatigue treatment can get you into big trouble, further ruining your thyroid. The general recommendations that adrenal fatigue proponents recommend is both supplement and diet. Oftentimes supplemental cortisol is prescribed when a deficiency exists. 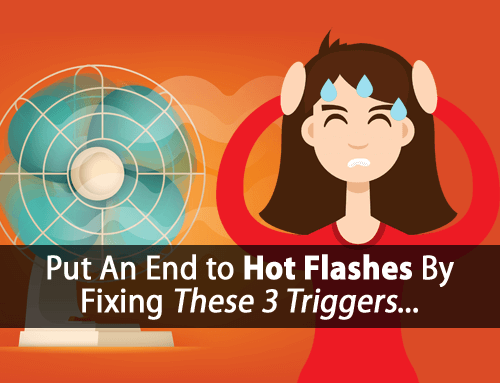 While this can help improve symptoms in the short-term, it’s ineffective in the long-term because it doesn’t do anything to fix the bigger and more pressing underlying problem. You’ll simply forever be dependent on a supplement while your thyroid remains continuously suppressed. The diets that are most commonly prescribed for adrenal fatigue recommend cutting out carbohydrates and increasing protein to regulate blood sugar. Unfortunately that’s a very backwards approach. Eating protein alone without carbohydrate actually lowers your blood sugar. So, you’re not regulating your blood sugar at all. You’re actually forcing your blood sugar lower, stimulating your adrenals even further, and forcing your body to produce even more cortisol to bring your blood sugar back up. And as I mentioned previously, cortisol suppresses your thyroid. So, in reality you’re just ruining your thyroid in the process. (Note: You can learn more about the dangers of low-carb diets and how they are dangerous to your thyroid in this article “Stop Eating Low-Carb (If You Care About Your Thyroid)”). The real solution to your adrenal problem involves breaking the viscous Thyroid-Adrenal Stress Cycle that’s sabotaging you thyroid. And this involves addressing this cycle from both sides. First, you need to stop the over-activation of your adrenal glands to decrease the excessive demand for cortisol. Second, you need to ensure that you have adequate thyroid hormone (T3) (and the ability to use it) to produce adequate cortisol when needed. So, here are some simple fixes that can help you do just that. And without glycogen, blood sugar regulation becomes extremely difficult. This is why hypothyroidism sufferers quickly develop blood sugar issues. And this is the primary reason why your adrenal glands become over-active when you become hypothyroid. Simply put, you become dependent on cortisol to break down protein within your body and convert that protein into sugar to bring your blood sugar back up. The only solution is to use your diet to do the job of your liver, until your liver function improves. (Note: Healing your liver is one of the most important requirements to overcoming hypothyroidism. I show you how we do this in this article “How to Heal Your Thyroid By Healing Your Liver”). And as mentioned previously, you can’t do this without adequate carbohydrates in your diet. Protein alone will only make the problem worse. This can be done by using more fruit in your diet. Fruit has a unique ability to regulate your blood sugar, both up and down as needed. And using it frequently enough will help to keep your blood sugar stable and prevent your blood sugar from dropping between meals and stimulating your adrenals. No, serotonin is not the “happy” neurotransmitter you might have been led to believe. It’s actually well known for activating your body’s stress response and your adrenal glands. When you become hypothyroid, you develop a dysfunctional state of metabolism that results in a decline in carbon dioxide production. And this is important because as your carbon dioxide levels drop, serotonin production rises proportionally. Anything we can do help stimulate oxidative metabolism and increase carbon dioxide production will help to lower serotonin. A simple way to do this is to use bag breathing. It’s as simple as breathing in and out of a paper bag (preferably through your nose), on and off for a few minutes three or four times per day. This can help you increase your carbon dioxide levels by reabsorbing some of what you’re breathing out. This in turn will increase your carbon dioxide stores to help to keep your serotonin lower, and ultimately help take some of the load off of your adrenals. Estrogen itself is also well known for both directly activating your adrenal glands as well as indirectly activating them by also increasing serotonin production. When you become hypothyroid, your estrogen levels rise because your liver isn’t able to detoxify it. Adequate carbohydrates, protein, and thyroid hormone are all necessary to help your liver detoxify estrogen. But a simple yet very effective way to help lower your estrogen is through the use of raw carrot. I show you exactly how to do this in this article on “How to Boost Your Thyroid in 60-Seconds with a Carrot”. Not only are polyunsaturated fats (PUFAs) extremely thyroid suppress and block every part of your Thyroid Hormone Pathway, they are also known to over-activate your adrenal glands. Not sure what foods contain PUFAs? They are found in many foods, such as nuts and seeds. And just about any liquid cooking oil is predominantly PUFA and should be avoided. The good news is that anything you can do to boost thyroid hormone is very effective at de-activating your adrenal glands and decreasing the demand of cortisol. Plus, anything that boosts your T3 will also help protect you from adrenal insufficiency by ensuring you’re able to produce adequate cortisol. It allows your liver to store glycogen, helping to regulate blood sugar. It increases carbon dioxide production, which helps lower serotonin. It improves your liver’s ability to detoxify estrogen. But, as I also mentioned previously, some people with severe adrenal insufficiency might not tolerate thyroid hormone (T3) all that well (elevated heart rate, heart palpitations, anxiety, etc.). This includes all medications and supplements that contain T3, including desiccated thyroid, cytomel, etc. This is because T3 makes you more sensitive to adrenaline, which can become quite elevated in hypothyroidism and severe adrenal insufficiency. In this case, it’s important to start very slowly with a small enough amount of thyroid hormone that doesn’t cause an adrenaline response. Then as your adrenal insufficiency improves slowly over time, you’ll be able to slowly increase your thyroid hormone as well. In any case, boosting your thyroid hormone can make all the difference. 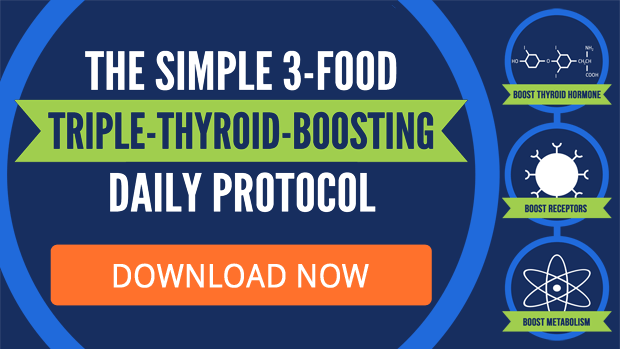 And you’ll learn about some very simple ways you can boost your thyroid hormone to help heal your thyroid and adrenals when you download the 3 Food Triple-Thyroid-Boosting Daily Protocol. This daily protocol will show you how a few little foods can make a big difference in your thyroid health. It’s something that I use with every single one of my clients… so it’s been tested and it doesn’t just work. It works extremely well. 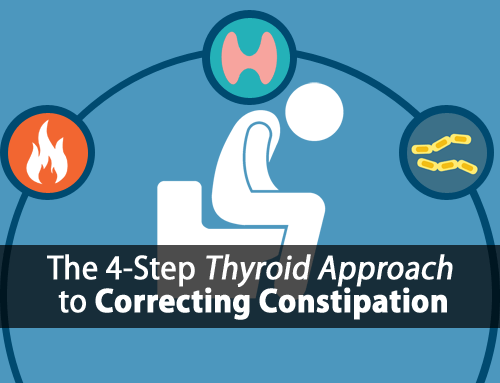 Not only will it help improve your adrenals, the 3 Food Triple-Thyroid-Boosting Daily Protocol is all about taking the first step to overcoming your hypothyroidism by fixing some of the hidden underlying issues that are holding your thyroid hostage. Hi Tom, thanks for this article! I’ve thought for years that my fatigue was an adrenal problem and always thought my thyroid was ‘fine’ (so did my health practitioner!) Hopefully this will help me overcome my fatigue once and for all! A couple of questions: Is supplementing T3 using medication what you would suggest? Or, in most cases, is your Triple-Boosting Protocol enough? Also, I’ve taken various herbal medicines/tablets for years to support my adrenals (like ashwagandha, licorise). Are there any you would recommend to heal the thyroid? Thanks again! Hi Sharene, supplementing T3 if/when needed can be important but we also have to address the entire thyroid hormone pathway (http://www.forefronthealth.com/overcome-hypothyroidism/) which requires diet as well. Even if we have adequate T3, if we can’t get it to our cells and our cells can’t use it, it won’t make much of a difference. Hi Guillermo, we don’t require T3 to produce adrenaline. It’s synthesized from the amino acid tyrosine, which we get from dietary protein. Wow. This is a bit backward from most things I have been reading, but it makes sense. I first told a doctor I had thyroid problems at age 18. I’m now 48. Unfortunately, not one doctor, until just 2 years ago, ever checked beyond my TSH level. “You’re fine. Eat less, exercise more.” I actually have Reverse T3 issues and Hashimotos. I’ve been saying I believe 30 years of untreated thyroid has caused my adrenal issues, not the other way around, and you’re the first person I’ve seen that says that. At this point I have very low cortisol, and my doctor says I’m running on adrenaline. About two months ago he lowered my T3 (Cytomel) and raised my NDT … I’ve felt like crap ever since. He’s worried about treating with T3 only because of the risk of palpitations, etc., but I felt pretty good when I tried just T3 for two weeks. I had no pain. We’re both concerned about muscle weakness with T3 though, which I’ve experienced. I’m starting to think my muscle weakness is something else though as it did not improve with the reduced T3 dose. Hi David, what do you mean by your adrenals went south? This is just as I mentioned in the article. You supplement hydrocortisone to help meet the demands but it’s not actually addressing the underlying problem. Hypothyroidism can result in all steroidal hormones becoming deficient (testosterone included) as they are all derived from thyroid/pregnenolone. Low testosterone by itself can be a sign aromatization. so by slowly correcting the pathway….i should be able to add more t3 to boost thyroid and eventually repair adrenals?….low t partly from vasectomy we think…. I was wondering how your protocol is used with people who have had their thyroid removed or killed with radioactive iodine? Haha…Got that one right Tom…Let’s show them how backwards we can be….lmao…Good job! I’d like to read your blog post about “How to boost your thyroid in 60 seconds using a carrot” but every time I click on the link it crashes. Is there another way I can receive the blog post? I have been doing the diet for over a month now.I love the chicken/cucumber/tomatoes recipe 🙂 . Doctor has me on bio identical progesterone and testosterone cream. I dont feel that well now.. lots of water weight now. I literally gained 6 pounds in 2 days. I am going to get in and retest my labs etc. I am wondering that now that I have been on this diet that maybe I dont need all that extra stuff .. I started the diet after he put me on the progesterone and testosterone because my estrogen was so high. the bio identical progesterone makes my cycle longer which is nice from 20 days to 25. I do break up my naturethroid where I take it a couple of times a day now.. I think that has helped too. Hi, you talk about adrenal insufficiency like its the adrenals not coping well but adrenal insufficiency in medical terms is Addison’s disease which is medically very different to adrenal fatigue; which I realise you don’t acknowledge and describe it as ‘faux illness’ but surely describing it as insufficiency is dangerous as insufficiency is life threatening. Also many would argue that fixing adrenals first due to stress will and does get you back to health. I think this is only aimed at folks with known thyroid problems? Hi Anita, sorry it sounds like you missed the point of the article. With severe adrenal insufficiency, supplemental cortisol can be necessary in the short term, but it’s just compensation and doesn’t fix the underlying problem. Dr. Hans Selye also showed that you could completely remove the adrenal glands of rats and as long as progesterone was kept adequate, they lived normal healthy lives. I’m Hypothyroid- have been taking Levothyroxine for 15 years, still getting symptoms, including severe panic attacks etc. I’ve only recently discovered your site and have bought the Hypothyroid Revolution Package, which I’m trying to follow. However, I’ve just read, here, your comments about Serotonin, and how too much of it causes Adrenal Stress Symptoms. Unfortunately for me, I also suffer from Clinical Depression, and have been taking 80mg Fluoxetine (Prozac) for 16 years. And guess what- Fluoxetine is full of Serotonin- so, is this what’s causing my stress/panic symptoms? And, if it is, what do I do- I’ve tried cutting down the Fluoxetine a couple of times before, but when I do, my depression gets really, really bad again. So what on earth an I do? Pleasehelp! Elizabeth madden, take a look at the fluoride in the thyroid meds and prozac. Fluoride in medication has affected my husband horribly. There is a very high amount in the prozac. OMG, I think you just saved my life. I have spent years bedridden in final stage “adrenal fatigue”, intolerant of the dosage of t3 I was given, and told I had to treat my “adrenal fatigue” first. Although fruit and potatoes make me feel much better, I kept getting told I needed to get more protein and fat to level my blood sugar and seal my leaky gut. I’ve been in this vicious cycle for 8 years now. Well meaning naturopathic doctors have been treating my symptoms and I’ve spent thousand of dollars doing so, but it seems we’ve all been missing the root cause. I hope I can find a doctor who will test my thyroid properly and help me with this approach which defies the current conventional wisdom. Thanks Tom! I’m really loving your insight. I’m a 41 year old mom of 6…I’ve just been diagnosed with sub clinical hypothyroidism with adrenal fatigue..lol…my FreeT3 is low but with a high reverse T3…and low progesterone. Your stuff just makes sense. I’m on 1/4 grain Naturethroid for 3 weeks as of now but your insight gives me hope I can fix the root causes. I’ve been beginning to implement your triple thyroid boosting protocol, thank you. Hi Marnie, thanks for reading! I’m 10 years post menopausal and stopped taking HRT for a few years but my bones started crumbling so I’ve started taking Tibolone again to protect them. My eyebrows have been falling out, my upper lip is white and I am bradycardic and hypothermic. Whatever will become of me!!! Hi Mal, there’s a big connection between hypothyroidism, progesterone deficiency, and osteoporosis/osteopenia. Can Doctors test for progesterone levels?? THANKS for the fab info!! My Q: I am following your program as closely as I can, but am almost 100% fructose-intolerant (and coffee intolerant!) I seem to go o.k. supplementing with glucose powder instead fruit (50%fructose/50%glucose) when insomnia hits with massive palpitations… Is glucose o.k. in the long run? I’m 41 yo F and tested positive for Hashimoto’s in Nov ’15. Saliva cortisol had falling pattern from am to pm but was high all day (been under extreme emotional stres for at least 5 years). Estrogen and testosterone were low but progesterone was fine! Was having symptoms of low estrogen (vaginal dryness) Now I’m on compounded estrogen & testosterone cream w/ DHEA. Ferritin is 22…hair is thinning. Will the estrogen in the cream mess things up even though I tested low? Thanks. Thank you Tom, and when you say T3.. do you mean FT3 ? I think that one is important to test and then see if it is low to work on. What do you do if you can’t tolerate even teeny tiny speck of thyroid? I’ve tried dividing my desiccated thyroid supplement into 1/16ths, and it’s still too much. I’ve never done cocaine, but I’m pretty sure I know how it feels now. (However, if sleep is your enemy, it’s fantastic.) I also don’t well any amount of caffeine or chocolate (but that more of a estrogen-dominance problem). Any suggestions? What if I am hypothyroid and my cortisol and estrogen are low? Will using an estrogen patch create more issues for me? I’ve been treated with adrenal support and am taking a T3T4 compound but levels are still inadequate. Hi Melissa, we can’t measure estrogen through lab testing because estrogen tends to accumulate in the blood and not the tissue. But also remember that even when estrogen production declines, progesterone production declines even further perpetuating estrogen dominance. And estrogen can continue to be produced via aromatization. Hi Tim.. you mean estrogen accumulates in the tissue not in the blood? and how do you test it, if not through labs, blood? Hi Tom, I have been hypo since 1989. My thyroid gradually stopped working over several years. What caused it I have no idea. One of the 1st symptoms I had was kidney problems and doctor just treated that didn’t check to see why I was having these problems. Gradually I lost my energy and started sleeping a lot during the day plus all night and really had to force myself to do normal everyday things. People had said to me that my skin looked yellow but to me looking in mirror it just looked brown. Finally I had all the classic symptoms of a heart attack and that got me heading straight to a doctor. Was told it wouldn’t have been a heart attack more likely a blood clot and smiled. Didn’t do anything about that but after telling her about skin colour she looked a bit closer and said to have thyroid checked. I have been hyperactive my whole life so metabolic rate would have been 26. In those days that’s what was measured and normal was 22 to 26. Mine was .05. She hummed and haaad about that and decided to send me to specialist so had another blood test and this was .01. The specialist had a fit when he got the bloods and rang her to get me on medication ASAP. This was gradually increased over a few months to get me on a normal dose. I came soo very close to dying and have no idea what caused it. Was supposed to go to the hospital for tests a few months after being put on medication but was told I would have to stop medication for 2 weeks. I said no way in hell was I going to do that after everything I had been through. Was told don’t worry it would take you 2 months to die so 2 weeks without meds is fine. I never had the tests. As a result of how low I got it did damage my heart. Not enlarged thankfully but damaged a heart valve and still waiting for that to be repaired or replaced. This info is a shocker. You recommend delicious cures. Over a year and a half, never had a morning basal temp of over 96.whatever, and only sometimes do I hit 97.9 or 98 later in the day. it varies, but not in the morning. One thing that has helped: Naturethroid; now I don’t feel cold, but still have grog. Have all measurements mentioned (by test–high estrogen, low cortisol), also, ugh feeling from adrenal supplements and I threw them out. Poor T3 conversion; selenium does not help. You really want a candida person to start with OJ? Seems it will be a gradual addition. Will go back to adding butter to my black coffee (but cholesterol was up 48 points after “paleo” experiment). Ok, get it: that’s because hormone is not being delivered to the cells. Interesting. Getting closer to commitment. So much craziness, for so long. Hashi diagnosis in 2013 was accompanied by lichen sclerosis that I couldn’t get a doctor to treat. I knew it was hormonal, but convention sees it as pain management. This is when I discovered OTC pregnenolone. LS resolved and estrogen dominance improved. My body makes progesterone from the pregnenolone; I use the length of my cycle to adjust my dose. DHEA was very high, but has fallen (along with my cortisol) since I stared pregnenolone and thyroid HRT; DHEA went from nearly 500 to just under 300 (still high) in two years. Have been disabled by fatigue since mystery illness in 2009. I have no tolerance for most tablet forming ingredients and high RT3. A trial of high T3 low T4 therapy gave me internal bleeding hemorrhoids and arthritis in my fingers. Those symptoms ceased as soon as we reduced my T3 and raised my T4. I had a lovely taste of normalcy that lasted for a week when we hit the human ratio of 11 parts T4 to 1 part T3 at 143:13, then my blood levels fell and RT3 rose. Raised my dose to 169:13 and my blood levels fell again. I eat starches, drink sweet-salty water, take a lot of supplements. Nothing I do nutritionally makes a difference; I just keep deteriorating. It seems to me that dietary strategies have a limited ability to compensate for metabolic problems but they can’t make my glands produce hormones. However, in the case of Hashimoto’s, the excessive estrogen often directly blocks the thyroid gland itself, preventing the release of thyroid hormone. As a family, we just recently found out we have MTHFR. My husband and I are both different carriers, so our 3 kids are split. Since MTHFR involves the liver, does the MTHFR have a direct correlation in blocking some of the liver “functions” in the Thyroid cycle? My son is sub-clinical hypothyroid and supplements helped him remarkably. Now, my daughter (13) is showing some symptoms (although her hormones are all out of whack right now with her age). I just recently found out I have chronic Lyme and my Dr. has put me on Armor thyroid, Progesterone, Testosterone (Bio-identical), which I have taken for a few months now. He also prescribed Fludrocortisone and Hydrocortisone, both of which I have been too scared to take. I got up to 1 tab of Armor, but experienced everything you listed above as a side effect, so I stopped taking everything for a bit. I started low dose on all again about a month ago, and just had labs done a few weeks ago, and I am low on everything again. My fatigue is my biggest complaint. I had horrible endometriosis, menstrual issues, and was highly estrogen dominant and did a purely natural program for several years eliminating xeno and phyto estrogens, taking several supplements to support all of that, and I can happily say I am so much better now. My OB was floored. I want to avoid those kinds of issues for my daughter. I will start on your protocol and see if this helps me, but should I go off of all meds and supplements (Selenium, Iodine, Mag, ALA, Vit. D3/K, Omega) again while I do this or transition off the meds while starting and increasing the time on your protocol? I’ve researched and learned so much over the past 5 years about healing the thyroid naturally because of my son. This is a completely different approach that makes so much sense. I thirst for this kind of information, but time restricts me a bit from delving into a lot of research these days. I am thankful I came across this, so thank you! Hi. Iive been on Thyroxine 100mg for many years dosage slowly increasing. I often wake with palpitations and have now got severe IBS for want of a better term. I also find exhaustion causing me to sleep in the day and have a lot of tension in my body huge sugar cravings and withdrawal from social life. Hi Tom, This is very interesting. I have hashimoto’s, celiac, CIRS, multiple food allergies and was told I have adrenal fatigue. Due to having SIBO and all of my allergies, I’ve been eating pretty much low carb for 2 years although I’ve tried to keep carbs up as I feel better on them. I’m now free of SIBO but pretty sure I have SIFO. I’ve been using anti-fungals but not improving so I just started flucanozole. My question is this, I’ve been supplementing with bovine adrenal , should I gradually stop that? I have about 15 foods I can eat, given all my allergies would I be able to follow your program? And one more, is there a liver test you recommend or do you diagnose liver function by symptoms? Whether you should or shouldn’t be using bovine adrenal depends on a number of factors. And unfortunately liver tests won’t pick up the issues that we are most concerned about. Thank you for the best information we can get. The propaganda is astounding that we have been coerced to believe is useful medical procedure. Hi Tom, thanks for all the info. I had a full thyroidectomy about 5 years ago,since then I’ve been on NP Thyroid and Cytomel. I’ve also been trying to raise my cortisol in the morning and lower it at night. . I’ve been having some problems with adrenaline lately. After reading your article 2 days ago, I stopped my Adrenal Rebuilder. Today I got back some of my labs from 2 weeks ago. Could you tell me if I should reduce my T3? Its never been this high. I’ve tried to download your 3 day protocol without any luck. I’ve been on your diet a year now. I have had the occasional off day but I lost my excess weight & have mostly felt well. Unfortunately, a few weeks ago I started to get headaches, lethargy, difficulty getting to sleep & waking during the night, night sweats, etc. It has come back. I rang my Endo’s secretary to see if my appt for March 2018 could be brought forward as I feel unwell. I had a “short synacthen test” on Tuesday of this week plus more blood tests ready for a now earlier appt mid December. (my cortisol is low). Before I had the test the nurse checked my blood pressure which was high. My bloods always come back “normal except recently my cholestorol was 7.3. I found your blog today very interesting because I thought I might have adrenal fatigue but I’m in the dark now. The progesterone I got from you disagreed with me. I recently went onto HRT patches & had to stop after 6 days because of a spotty scalp, bad headaches then dark sombre thoughts, so progesterone doesn’t suit me. I find your knowledge very helpful but am anxious as to what medication to use. I’m not on any medication but know that I need something to get me back in balance. Do you think I should use T3? I’m sorry I haven’t got blood results for you. I don’t think the testing here in the UK is as thorough as yours. I’ve heard about saliva testing which says gives a more accurate result. Are there any questions I can ask my Endo or do you suspect what I might need to get better?